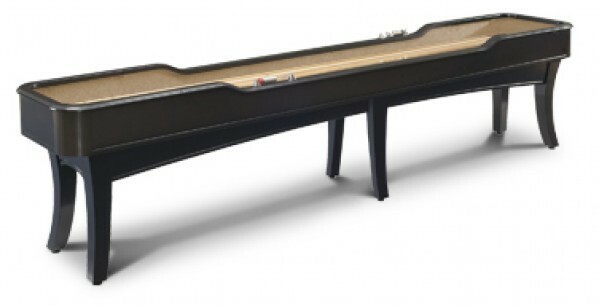 Modern, sleek and stylish, the Ella 14 foot shuffleboard has all designer touches. The Ella play field is 3" thick x 20" wide and is made with North American, plantation grown yellow poplar. The playfield surface is .25 inch thick poured polymer for a lifetime of durability. The modern style of the Ella sets it apart from the competition and the quality and durability is backed with Legacy's lifetime warranty. For storage of your pucks, brushes, and other accessories, the Ella Shuffleboard table provides the Perfect Drawer, a glide in storage drawer mounted under the table. Ella Shuffleboard comes complete with four pop-up LED lights neatly tucked into the top rail of the shuffleboard.